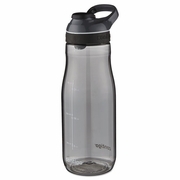 Cortland water bottle is passionately engineered to offer convenience to those on-the-go. Features patented AUTOSEAL® technology, so lid automatically seals between sips to eliminate spills and leaks. Easy to operate bottle is designed for one-handed use with no caps or spouts to remove; simply press the button to drink and release it to automatically seal. 100% spill-proof water bottle features a carry clip for easy transport, a protective spout cover to keep out dirt and germs. Easy-clean lid flips open completely for thorough cleaning. No plastic odors or taste; bottle is made with FDA-approved, BPA-free Tritan™ materials. The AUTOSEAL® bottle is designed to prevent accidental pressing and spillage. Fits most car cup holders. It’s also top-rack dishwasher safe for easy cleaning.